BANFF, ALBERTA – Canada – Whether you’re a first-time or long-time climber, Yamnuska Mountain Adventures has the right Canadian Rockies tour for you. Join our experienced mountain guides on a world-class trek through the scenic Rockies. Located in Canmore, Alberta, we also operate trips all over Alberta and British Columbia. For over 30 years, we’ve been guiding climbers of all levels on trips, courses and programs that span anywhere from a few days to a few months. Check out our scheduled programs, our talk to us to developing a custom itinerary that meets your needs. Scrambling Skills – 2 days in Alberta – Learn basic scrambling skills and judgement for non-technical scrambling peaks. Scrambling is defined as easy climbing requiring use of hands and feet, but not ropes, belays or protection. Clearly defined trails are not always present, calling for the occasional use of hands. Snow and Ice Long Weekend – 3 days in Alberta – Low commitment introduction to basic mountaineering. Learn safe mountaineering practices on snow and ice before practicing on a summit bid of a peak on the Columbia Icefields. 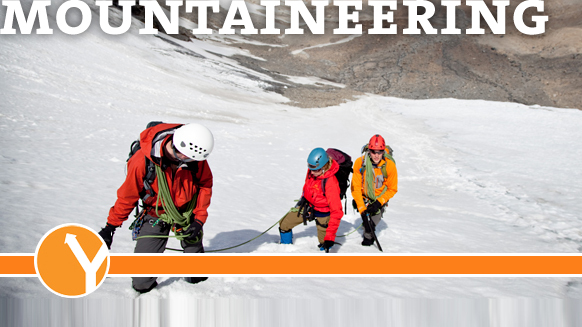 Intro to Mountaineering – 6 days in Alberta – Canada’s premier course for beginner mountaineering instruction. Based out of Banff National Park, this comprehensive program provides a solid grounding in mountaineering. We provide transport, hut accommodations, gear, and food. Youth Mountaineering Course – 6 days in Alberta – In-depth skill training, plus practice on peak ascents for mountaineers aged 15 – 17 years old. Parents are welcome to join the program. Wapta Ice Hike -3 days in Alberta – Traverse the Wapta Icefields traveling hut to hut. Ideal for a more casual mountaineering experience. Bugaboo Ascents – 3 to 7 days in British Columbia – Climb this famed group of granite spires found west of Canmore in the Purcell Mountains for high quality alpine rock climbing. Suitable for all levels and ages 10 and up. Mount Athabasca Ascents – 2 to 3 days in British Columbia – Climb one of the highest peaks in the Rockies following one or two days of basic instruction. Private Guiding & Instruction – Alberta, British Columbia and Internationally – Tailored to your personal schedule and requirements, and in a location of your choice. Very friendly for beginners. Yoho Peaks – 4 days in British Columbia – Intermediate mountaineering in Little Yoho Valley. Ideal progression from Snow & Ice and Intro courses. Intro to Alpine Ice at the Columbia Icefields – 4 days in Alberta – Technical training on steep snow and ice with instruction on snow and ice anchors, leading multi pitch routes and assessing mountain hazards. Bugaboos Granite – 5 days in British Columbia – Climbing and instruction on famous alpine rock. Designed for intermediate rock climbers who also have some mountaineering experience. Lake Louise Classics – 3 to 6 days in Alberta – Climb the peaks surrounding Moraine Lake and Lake Louise, including Mt. Victoria, Mt. Fay and Mt. Lefroy. Mount Athabasca Ascents – 2 to 3 days in Alberta – Climb one of the more advanced routes on one of the Rockies highest peaks. Mount Assiniboine Ascents – 3 to 5 days in British Columbia – Climb with a guide on this mighty Matterhorn-like peak. Bugaboo Ascents – 3 to 7 days in British Columbia – Climb this famed group of granite spires found west of Canmore in the Purcell Mountains for high quality alpine rock climbing. Mount Robson – 5 days in British Columbia – Mount Robson, the tallest peak in the Canadian Rockies, stands at 3,954m and provides a challenge for intermediate and experienced climbers. Private Guiding & Instruction – Alberta, British Columbia and Internationally – Tailored to your personal schedule and requirements, and in a location of your choice. Become self-sufficient in 1 – 3 months with Yamnuska’s Semester Mountaineering Program in the Canadian Rockies. The ultimate mountaineering training option, this is often the initial step for many of our guides. Choose from spring or fall curriculums. Watch this Yamnuska Mountain Adventures video and join one of our awesome Canadian Rockies mountaineering tours today!